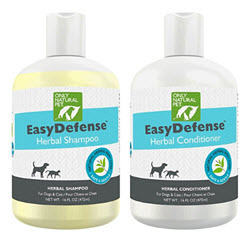 Going natural for flea, tick, mosquito and mite control is the most affordable and cost-effective protection available for your dog. 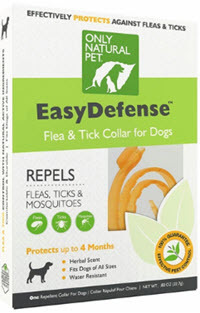 Guaranteed to protect your pet from biting insects e.g. mites. 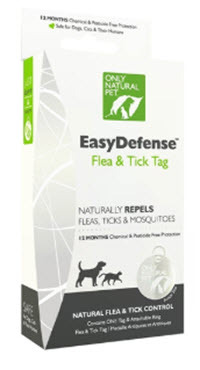 The Easy Defense Flea & Tick Tag takes just three weeks to activate, and must be clipped to a flea and tick free dog who is kept flea and tick free for the duration of the activation period until protection clicks in. The tag offers long-lasting protection for your pooch and you will not only gain a happy healthy dog but gain more for your buck. Just clip it on and forget it! Many of us sleep with our pets, but should we sleep with their fleas? Lets get rid of the little suckers! How many people sleep with their pets? A recent survey of dog owners carried out by the American Pet Products Manufacturers' Association found that 71% of dog owners spend their nights snuggled up with their dogs. A similar survey in England found that 44% of respondents sleep with their dog. The majority sleep under the covers, whilst the remainder sleep either at the end of the bed or on the pillows. Not surprisingly, stats for cat owners are very similar. It is fair to say that a similar percentage sleep with their cats and it is also worthy of mention that many people sleep with both their cat and their dog! Although fleas are more likely to be a problem during warm-weather months, they can also cause problems during cooler seasons due to their ability to continue their life cycle indoors. If you have fleas in your beds, please don't blame the your family pet. It's not his fault that he has been allowed outdoors without wearing some form of flea protection. I'm afraid to say the blame lies entirely with his owners. Once fleas have made their way indoors courtesy of your pet they don't stay long on your pet. Recents stats indicate 5% of the flea population in your home will be on your pet; the remaining 95% will be ensconced elsewhere, which of course includes your beds. Sheets, blankets, eiderdowns, duvets and comforters make a perfect hideout for fleas and their off-spring. Fleas love warm dark places to set up home and together with your dog's blood and your families' warm blood on tap, they are in absolute nirvana in your bed! Once fleas and their off-spring (eggs,larvae and cocoons) have set up camp, it is the devil's own job to get rid of them. By their very nature they are tenacious little nasties and getting rid of them is far easier said than done. If you have an infestation you are best to over-do than under-do. Off course it is a priority to treat your pet, but this must be done in tandem with cleaning and vacuuming your carpets. First off bath your dog with a herbal Shampoo and Conditioner The trick here is to lather up your pet and leave the shampoo on for a minimum of five minutes at least. Any less and you are wasting your time. 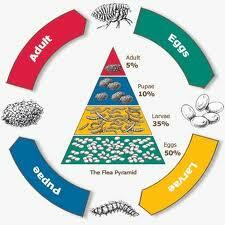 Five minutes are needed to completely drown all adult fleas and kill all of the off-spring in the flea's life cycle. Follow up after his bath with an herbal Spot-on treatment together with attaching a Flea Tag on an herbal Collar. Wash all your bed linen, that includes every single item you use to make-up your bed in very hot water and detergent. Wash every bit of your pet's bedding with very hot water and detergent. Dry all bed linen in a clothes dryer and set it at the highest temperature allowed in accordance with care label instructions. Above 90 degrees Centigrade is best if permissible. Dry your pet's bedding in the same method as your own, when dry, dust it with flea powder. Rewash and dry all your bed linen every 3 or 4 days to kill any newly adult hatched fleas which may have slipped the net. Continue to do this until you are on top of the flea infestation. Rewash and dry your pet's bedding every 3 or 4 days as well. Spray your mattress with a natural repellant to kill and repel any future fleas. 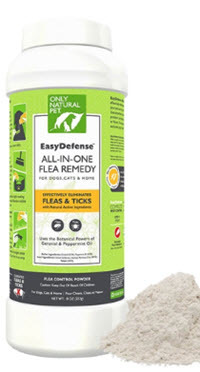 Please take a moment to read our page on Home Flea Remedies and peruse our Stop The Fleas Products page. 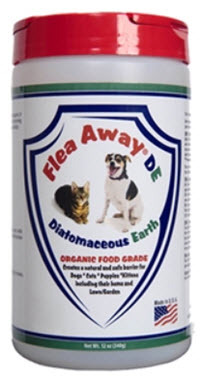 There you will find a plethora of different "Only Natural" flea control and prevention products. 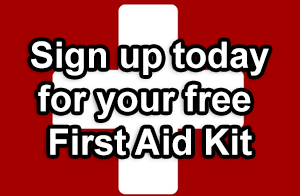 All are safe to use around children and pets and can be ordered online. Your Vacuum cleaner is your greatest weapon against fleas in your bed, under your bed and in your home. Vacuum daily until you are sure you have the problem under control. It's a good idea to put a Flea Collar inside the vacuum bag and once the bag is full, seal it and dispose of it off your property. The video below is well worth watching. The Desmonds administered a chemical spot-on flea and tick control product to each of their five terriers. Within an hour of application all five dogs became sick ranging from vomiting to difficulty in breathing and one even had skin burns on its back. Watch their dogs' horrific experiences on video.